Digital Marketing Budget: How Are Your Competitors Spending Theirs? More than half of companies with revenue under $50 million already spend the majority of their marketing dollars online. And roughly 70 percent plan to increase the share of budget devoted to digital marketing over the next two years. But the channels they focus on change as their companies grow. Understanding where your competitors are shifting their digital marketing budget, allocating their spending, and how your efforts should evolve as your firm’s revenue increases is vital to your marketing success. The majority of businesses of all sizes find social media to be the most difficult channel to manage, and generally view pay per click (PPC) advertising as the least challenging. The majority of all businesses report that social media and email marketing have the highest ROI. What’s most interesting about the report is how spending tends to shift over time. Here are five main findings that detail how marketers change their digital marketing budget allocations as their company’s revenue grows. SEO: Though just 12 percent of the smallest firms (under $1 million in revenue) see SEO as their highest spending priority over the next two years, about 20 percent of all larger companies plan the biggest investments here. In other words, there is a shift to allocating more digital marketing budget to SEO as a company passes the $1 million revenue mark, but it stabilizes after that point. Email: There’s a significant shift here as companies grow. 31 percent of companies in the $10-20 million range plan to invest the most here over the next two years, while just 6 percent of businesses in the $1-5 million range say the same. As the report notes, this is likely because as companies get larger, the size of their opt-in email lists grow as well, making those lists more valuable. Online advertising: Regardless of company size, roughly one in five marketers say this is where they will spend most of their digital marketing budget over the next couple of years. Social media: While 22 percent of the smallest businesses plan to invest most heavily in social media, just 8-10 percent of companies with $10-50 million in revenue say the same. Spending on posting and tools for social media monitoring and management becomes a smaller part of the digital marketing budget as firms grow, since larger firms are able to generate more social buzz through their employees, customers, and industry influencers. Video: Along with text-based content, this is one of the most popular formats. Across company sizes, roughly a third plan to spend the largest portion of their content budget on video over the next two years. Text: Firms tend to spend proportionally more on written content (white papers, ebooks, blog posts, etc.) as they grow. While just 19 percent of companies in the $1-5 million range plan to spend most of their digital marketing budget here in the next couple of years, 39 percent of businesses in the $10-20 million range intend to do so. Visual content: The mirror image of text-based content, the share of the digital marketing budget devoted to photography / photo sites, social media images, and infographics declines as companies grow. While 34 percent of businesses under $5 million in revenue plan to spend the most on this format over the next two years, just 8 percent of companies with $10-20 million in revenue said the same. Audio: While interest in podcasting increases somewhat with company size, it’s low across all groups. Just 6 percent of companies in $1-5 million range plan to focus budget here in the next couple of years, and that rises to only 10 percent for firms with $20-50 million in revenue. Not at all surprisingly, these budgets increase with company size. Only about a quarter of firms with less than $1 million in revenue will invest $2,000 or more per month on organic SEO or paid search engine marketing (SEM). More than half (65 percent for SEO, 57 percent for SEM) of companies in the $1-5 million range will do so. In larger businesses, 80-90 percent will devote at least that amount to each channel. SEO and SEM: SEO efforts generate, on average, about 10 percent of website conversions, with SEM/PPC contributing roughly 6 percent. These figures vary only slightly by company size, and don’t show any clear upward or downward trend as businesses grow. Email: This tactic generates less than 30 percent of conversions in firms under $5 million in revenue, but accounts for between a third and half of all conversions in companies with $10-50 million in sales. Again, this is likely because bigger companies have the list size, tools, and expertise to do more sophisticated segmentation. SEO: There is a clear increase in the share of companies saying SEO produces the best return on investment (ROI) as company size grows. While just 5 percent of very small businesses (under $1 million) identify SEO as their most cost-effective channel, 20 percent of firms with $20-50 million do so. This makes complete sense: larger firms are not only able to produce more content, but they are also able to attract more high-quality backlinks through their PR, influencer marketing, analyst relations, and other efforts. Email: As noted above, the value of email marketing increases with company size, and the same holds true for ROI. Only 15 percent of very small firms say email produces the highest ROI, while 46 percent of companies with $10-20 million in revenue make that statement. SEM: The productivity of PPC advertising appears to increase somewhat with company size, though the study data are less clear on this point. It would make sense that higher brand recognition would make online advertising more effective. Social media: The trend for this channel is the opposite of the pattern for SEO and email marketing, declining with company size. While 31 percent of marketers in companies with under $1 million in revenue say social media marketing produces their highest ROI, just 10 percent in firms with $20-50 million in sales say the same. This likely doesn’t mean that social media becomes less effective as companies grow, but rather that channels like SEO and email become relatively more productive. Don’t know: Again not at all surprisingly, larger companies tend to have more sophisticated web analytics capabilities. More than 40 percent of marketers in very small companies say they don’t know which digital marketing tactics produce the highest ROI, but that figure drops to 10 percent in businesses with $20-50 million in sales. Still, 10 percent seems like a lot of marketers who may be challenged to justify their digital marketing budget spend. The small sample size in the larger company revenue ranges (there were just seven respondents in firms with $50 million+ in revenue) make those figures less statistically valid. Compressing the number of different size ranges displayed would have helped. It’s challenging to draw statistical conclusions from small data sets, but can be done through techniques like permitting multiple responses, as was done effectively in last year’s report from B2B Marketing Zone, How B2B Marketing is Changing. Though granted, this study focused on digital strategy, it would have been enlightening to see some comparison in online spending versus specific offline channels. For example, event marketing is often the single biggest line item in marketing budgets, and two-thirds of B2B marketers say live events are their most effective content marketing tool. So it would be interesting to know how spending and ROI on SEO, SEM, and other digital channels compares. Conversion rate optimization (CRO) isn’t a lead gen tactic, and including it distorted the results somewhat. SEO, SEM, email marketing, and social media are all focused on driving visitors to your website; CRO impacts the share of visitors who convert once they arrive there. But those are minor points. 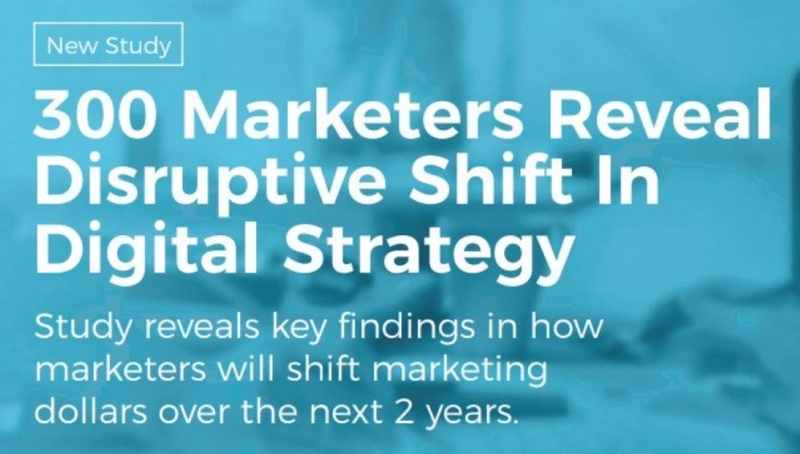 Overall, 300 Marketers Reveal Disruptive Shift in Digital Strategy is a valuable and insightful report. Above are just a few of the findings, so check out the full report for more.